I have need of further help fot the following. I have 4 brownells 10/22 recieverz on the way. 1 benchrest fun, i would like to find a stock similar to ruger's new custom shop 10/22, lilja barrel need help with trigger pack, bolt etc. FM-9 pistol lower, need help with selecting 10inch upper. 1 AP ar15 lower in green, this one i think will end up becoming a 300 blkout sbr. 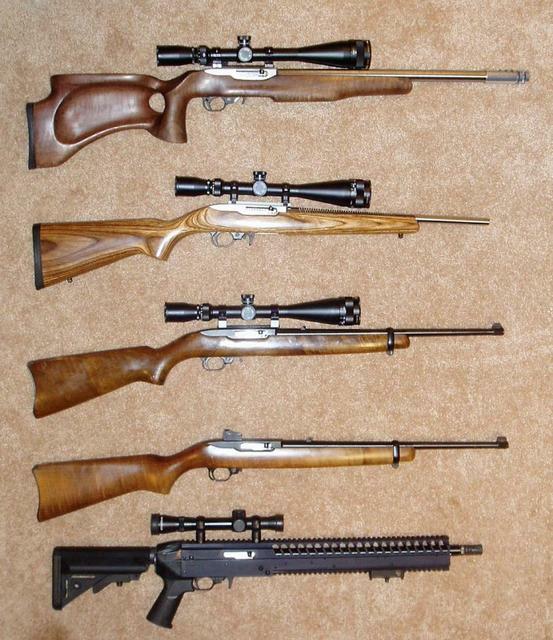 The original 10/22 came out in the mid-1960s. Can you come up with a design that would make it look like it came out in, say, the 1950s or 1930s? Bonus points for a stock that would've made the Winchester or Remington of the Bonnie 'n' Clyde days cry with jealousy. Build a pistol that would balance well (however you define the concept) and give the Charger a run for its money. IMHO the interesting part of the challenge would be the aesthetic one - current day "one-handed rifles" are generally pretty fugly. Your choice of configuration, but figure out how to set it up for camera-aimed remote operation. Bonus points if you can get it to work on a flyable drone. You need an iron sight based plinker. Wood stock, something with some nice grain in it. I have a winchester 75 in full manlicher stock sporting lyman globe sights for that slot, followed by a pre 64 ruger 10/22 international same manlicher style stock. With stock sights. Hah, if i did not own an m1 carbine, I would do it in a heartbeat. Though, I am considering one of the 5.7 ps90 clone kits. For the first one I am goin to build the benchrest style 10/22. So far I thinking of two different stocks. bell and Carlson's Odyssey style 2 way adjustable. Obviously, there is a price difference. 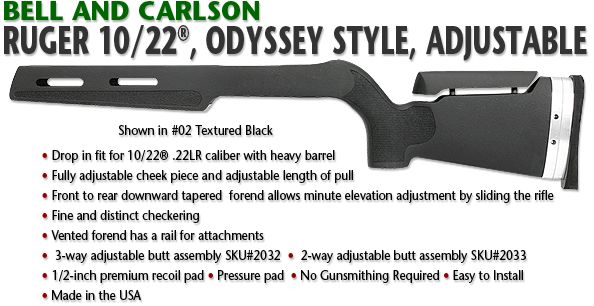 I have had a few Bell and Carlson stocks in the past, but none for rimfire rifles. What do you all think? Can Kidd supergrade barres be used on non-kid receivers? I have an email into Kidd About this but have not heard back. We shall see how it all goes together. I typically shoot at 66 to 125 yds with my 22lr's. My go to scope has been a hawke sidewinder 6-24. I also have a couple of swfa 10x scopes for my walk around guns. Being that this is a beast and a half. I am looking for a good fine cross hair scope. Weaver T-Series XR Rifle Scope 36x 40mm and their 48x seem to be good options. Does anyone here have any exp with the most recent versions of the weaver t series? I've long been wanting to build a Chicago 10-22 Tommygun ... But I always seem to find something else to do with $319 for the kit ... But maybe it's time to liquidate some odds & ends laying around the funroom to fund it! It is done and together. I will give it q test shoot once i have the range finished. Mine came out really well. Ah well then my work here is done. I have several form 1's to file over the next few weeks. My mpx,kriss v, my bnt, a 300 blkout, a fm9 pistol (mabye) and a 10 inch 10/22. That will leave me with two 10/22 recievers. Right now i am thinking of two tapered barrel units for each of my kids. Something to pass down. Maybe an ultra light and 1 tapered. Dunno yet. Okay. Issue found. I have the rifle tuned. It is shooting standards very nicely. I can get good groups. My issue is, I am now on my 3rd scope. hawke sidewinder, Cabelas ffp 6-24, Nikon 6-18. None have enough elevation adjustment to get the damn reticule to center at the 66yds my range is set. I am bottoming out. I am at a loss. Lower rings, I am not fond of this pepr mount for this. Recommend a few good scopes with enough elevation adjustment for me. 66yds is my standard range, though I often lob out past 100. None have enough elevation adjustment to get the damn reticule to center at the 66yds my range is set. I am bottoming out. I doubt it's a scope issue. With a scope perfectly parallel to the bore, you only need 5-ish MOA of elevation to attain a zero. This means there is something out of whack with your rings, your mount, and/or the receiver. It's an alignment thingie of some sort. Essentially there is a negative cant built into your rings/mount/receiver at this time. 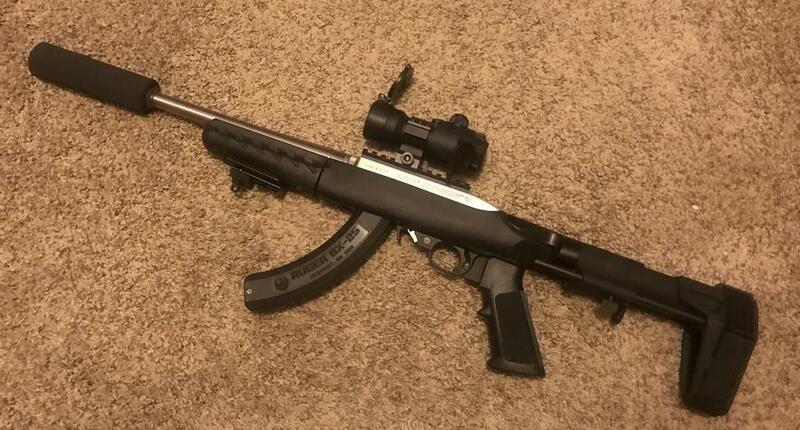 You might post a picture of the setup, and those familiar with 10/22s might be able to help. I think once you have this issue figured out, your current scope options should be fine. 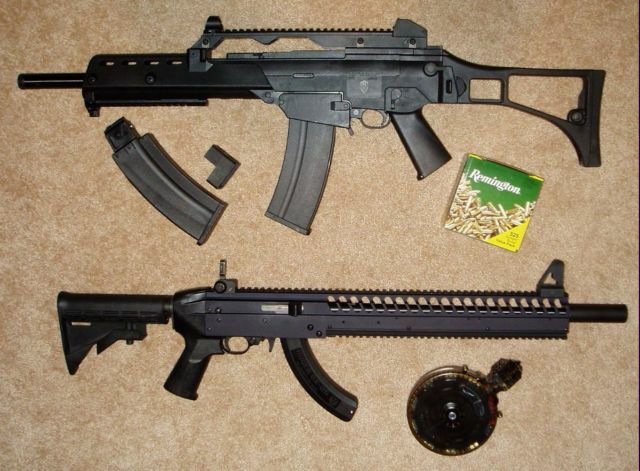 I currently have two 22lr rifles -- a bolt action and an AR-15 upper. I have 20 MOA cants on both, zeroed at 50 yards, using NF SHV 4-14x scopes. I can dial elevation out to 300 yards without holdovers, using subsonic match ammo. Fritz, I went and used some calipers on my ring set up. IE the green 10/22 shown above with the Cabela's scope. It is 1.65 inches over the rails. I ordered some lower mount rings that will allow for some better adjustment. I was simply at a loss. I did not think I had the scope canted. But, apparently it is. It is good to have a second voice say the same thing I was thinking. I don't think it's the height of the rings per se. Think of it this way -- assume the mounting system places the center of the scope exactly 2" higher than the center of the bore. If the mounted scope is perfectly parallel to the bore, the scope's reticle elevation is perfectly centered on the scope's bore, pointing the gun at a target 50 yards away, the bore is pointed towards a dot that is 2" lower than the reticle. 2" at 50 yards is 4 MOA, so dialing up the scope's elevation up 4 MOA lines up the bore to the point of aim. Now gravity will make a bullet drop over the course of flying that 50 yards. I don't feel like looking it up in tables right now, but for a 22lr subsonic, that drop over 50 yards is probably no more than 1-2 MOA. Therefore, you will likely have to dial up 5 or 6 MOA to get a 50 yard zero. Your scopes can easily handle that minimal amount of elevation dialing. Your ring-height-over-bore measurement/alignment can't be done with just one measurement, and likely can't be done with calipers at all. I suspect that somehow the bottom trough of your rings are not parallel to the bore. I suspect the rings point upwards -- away from the bore. I don't know if you have the ability to sight down the bore of your 10/22 (many 10/22 receivers don't allow this). If you can, here's one way to check it. Clamp the rifle in a solid vise. Aim the bore at a dot that you can clearly align with the center of the bore, as far away (at least 10 yards, but up to 50 yards) as possible. Remove your scope from the rings/mount. Sight along the bottom of the rings, and compare that sighting line to the bore's aiming dot. If the rings' sight line is more than 1.65 inches higher than the bore's aiming dot, you have a receiver/mount/ring alignment issue.